In 1895, Mr. J.C.F. Elmore purchased the furniture store and undertaking business in downtown where Murph's Appliances are located on Main Street. Mr. Paul R. Wagner came to Vermillion area in 1916 to work for the J.C.F. Elmore Funeral Home. 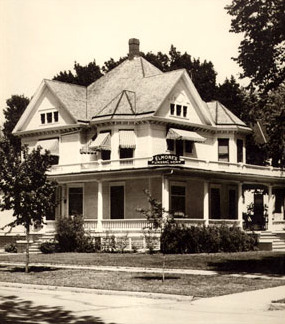 They both purchased the present location, which was furnished in February of 1903, called the Barton Mansion for the funeral home in 1936. Mr. Myron Iverson came to work for the funeral home in 1936. Mr. Elmore sold his interest in 1944 to Mr. Wagner. Mr. Wagner continued operating the business until 1966 when he sold the business to Mr. Iverson. Mr. Iverson remodeled the chapel, built the garage on the back of the building and also installed an elevator. After operating the business for 15 years, he sold the funeral home to Mr. Alton Siecke in May 1981. Mr. Wagner died in 1983. Mr. Siecke built the casket selection room above the garage and removed all the paint from the woodwork and paneling from the walls. He also added a new preparation room, the original preparation room was made into an unisex bathroom, put down new carpet and stripped the wall paper off the walls and repapered them. Mr. Iverson died in 1999. Mr Siecke operated the business over 26 years before selling the two funeral homes in 2008 to Tom and Lori Kober who came to work for Alton Siecke in 1996. Al continued to work and be involved in the funeral businesses until May of 2010 and died in 2010. We remodeled the casket selection room with cut-out casket display, children’s room with a Winne, the Pooh theme, and a family arrangement room with a long conference table with chairs and electric fireplace in 2014. In the summer of 2018 we had a new landscaping appearance. "I will continue to do business with the high standard of excellence that I learned from Al, he learned from Myron Iverson, who learned from Paul Wagner who learned from J. C. F. Elmore. I am proud to be part of their legacy which in time I will pass on."